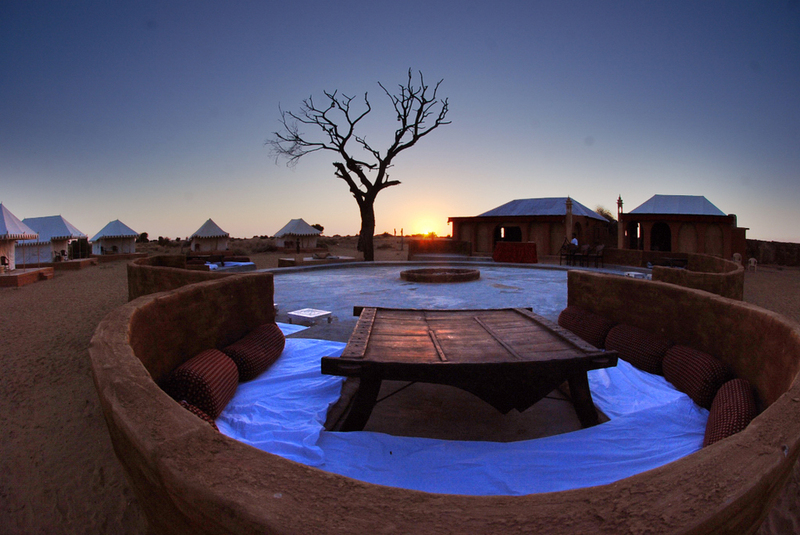 Damodra Desert Camp is located approximately 30kms outside of Jaisalmer on the way to the Sam sand dunes. 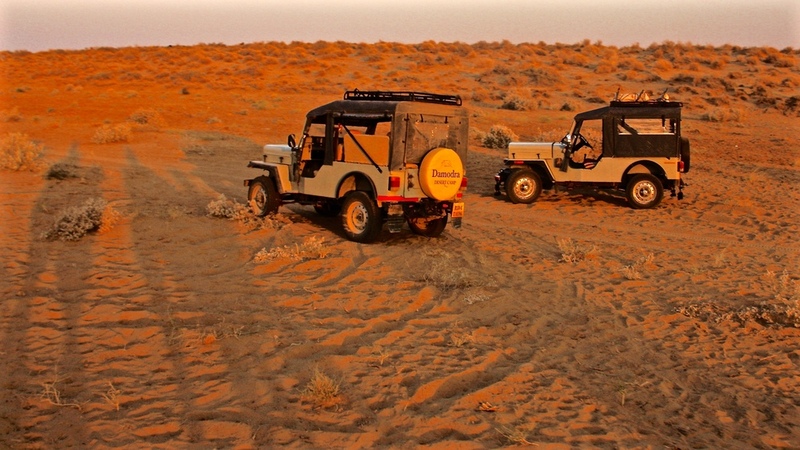 Situated like a golden mirage in the charming romance of the Thar Desert. 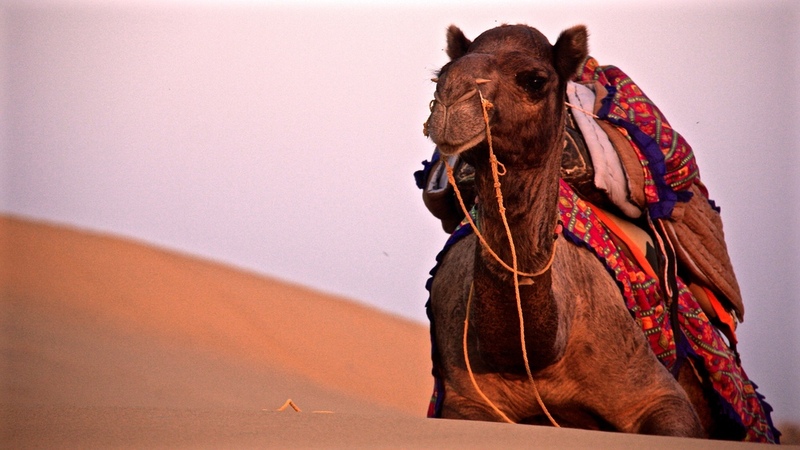 Come experience our luxury tented accommodations, camel safaris and unforgettable adventures in the golden sand dunes located outside Jaisalmer, the world famous golden city. Damodra Desert Camp has 10 deluxe swiss cottage tents with comfortable beds, either one king size or two twin size beds. All premium white bed linens and towels are included, as well as premium ayurvedic toiletries. Each tent has an attached modern bathroom with shower, western flush toilet, hot and cold running water. Each tent has a fan, A/C and heater. 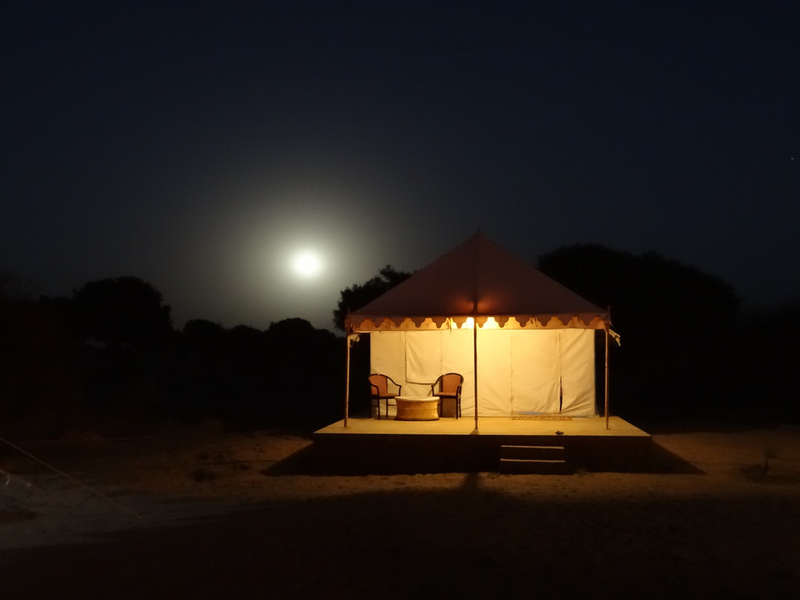 Damodra Desert Camp is located approximately 30kms outside of Jaisalmer on the way to the Sam sand dunes. 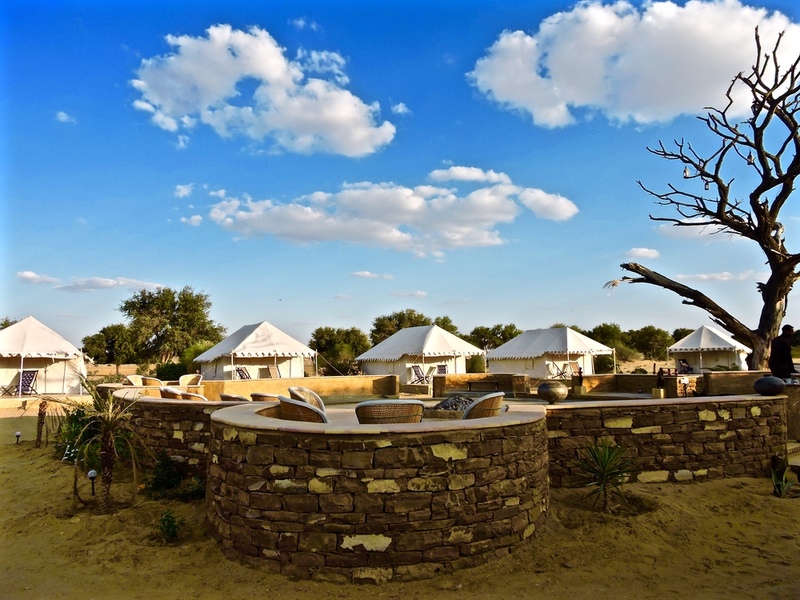 Situated like a golden mirage in the charming romance of the Thar Desert, the camp combines comfort, conveniences and modern facilities with the warmth and personal attention of traditional Indian hospitality. 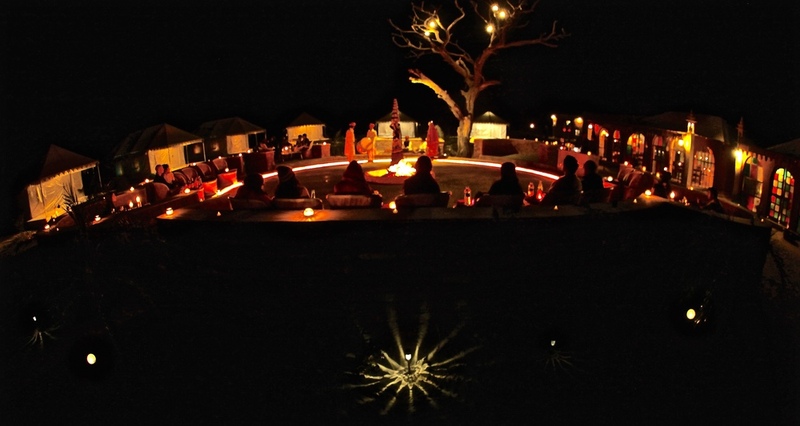 We offer a unique opportunity for the traveller to experience the rich cultural heritage of Rajasthan. In the evening, sit around our huge camp fire under the countless stars above. 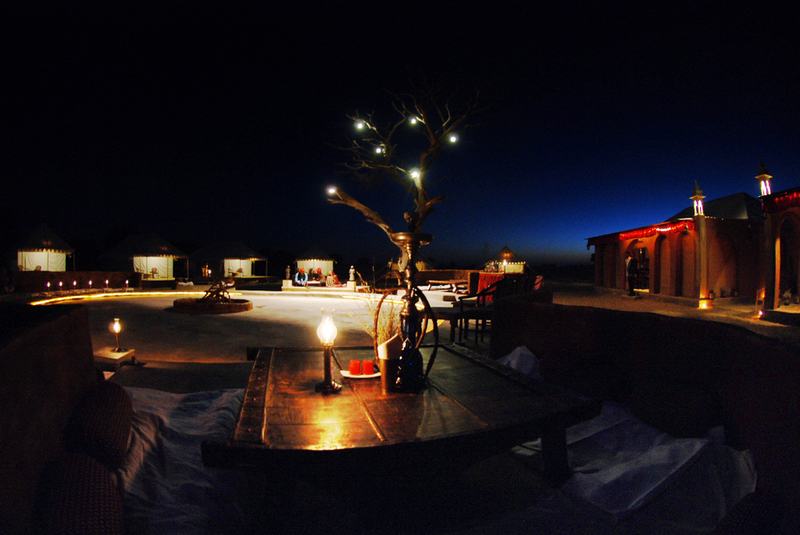 You will dine on delicious, freshly prepared Rajasthani food and be entertained by local musicians. The desert night sky is remarkably free of light and other pollution giving you an amazing opportunity to view the stunning constellations and incredible pathway of the Milky Way as it stretches across the sky. Stay out long enough and you are sure to see many shooting stars. At the end of the day – whether it has exhausted you, refreshed you, or has just been all-around mind-blowing – take a walk to the nearby dunes and watch the golden sun settle gently beyond the horizon. Meanwhile your camp crew will light a roaring fire, prepare you chai, snacks, and a traditional Rajasthani dinner, and entertain you with traditional music and dancing. And if you still have not had enough of the day – we encourage you to take time to wonder at the magical desert night sky unhindered by pollution or other lights, before you go to sleep. Lodging in a fully-equipped Swiss cottage tent. Authentic Indian Dinner, appetisers, and Indian and continental breakfast, mineral water and Indian chai tea/coffee, soft drinks. 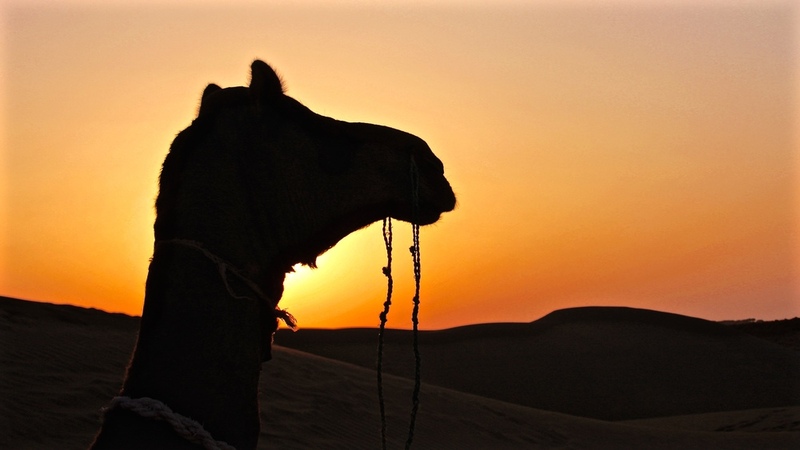 Camel ride to sand dunes to watch the sunset over the desert. 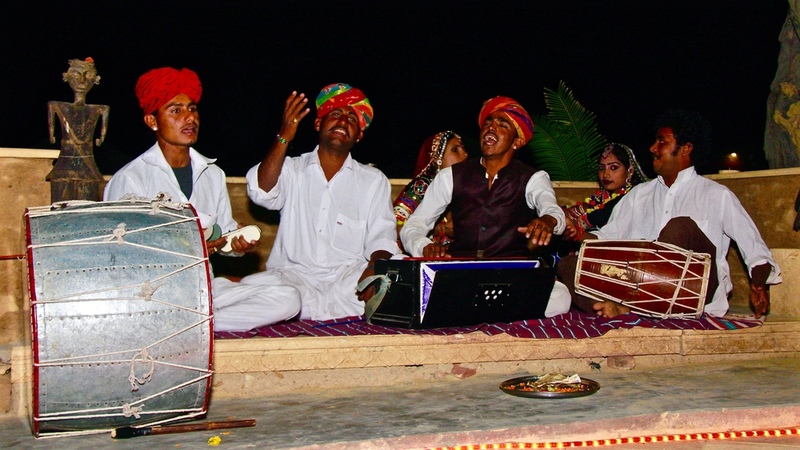 Live traditional Rajasthani music and folk dancing in the evening.